Home > Fan Art Galleries > Dedede-Daimyo > 3D Daimyo Dojo! Woah! Sorry everyone! My internet expired 2 days ago, and I was unable to upload daily, but now I'm back! Here is my characature again, done in the Milkshape 3D modeling program, in different poses than before. Displayed are the wireframes, polygon figure, and a hammer strike motion. On a side note, I am helping work on Leirin's: Kirby's Greatest Hits Super Songbook, this time making a picturescroll of Kirby's Dreamland 3! I will upload both my pics and lyrics when I have finished. Album name: Dedede-Daimyo / 3D Daimyo Dojo! Man, you are just too good Daimyo! This is another amazing set of models. The poses are excellent; it even makes it easier to envision him with this get-up in Brawl--sooo cool. Wow, he begins to move!! He seems to be alive! So about parts like the beak that you asked on the Bonkers model. First, you "Snap Together" vertices that are closeby the area you want to smooth out, then use "Weld Together". It's a tad bit annoying at times, but experiment with it, and I'd say you'll get the results you're looking for. I think you'd know this already, but Shift+Left click to add to a selection, Shift+Right Click to deselect. Those'll be your best friends when it comes to this. So uh..Minion...anychance that maybe this guy could be a cameo on KCCH? Like a painting in DDD castle or something? Cuz ya gotta admit, this guy is a pimp at making his DDD! This is so cool DDD-Daimyo! GIGAROB, STOP SAYING MINION. GOODNESS DANGIT IT'S MINON, AND I ALREADY SAID THAT NOT TOO LONG AGO. *ahem* anyways, we already planned for a ways to stick some KCCh fan art, so I can include stuff like this the same way. Hehe. sorry... I mustve missed it when you said it the first time...sorry Minon. (little off topic) Wow, never seen Minon angrey before. I usually try to stay polite, but some stuff pushes my buttons. That particular name mistake has a bit of a history, so yeah. IT'S MY PLAYER'S GUIDE, AND I REA--oops! Wrong line! Daimyo, was your last Dedede-Daimyo model your first try at 3-D rendering with Milkshape or not? Thank you Minon for your advice. Thank you all, the rest, for your support. 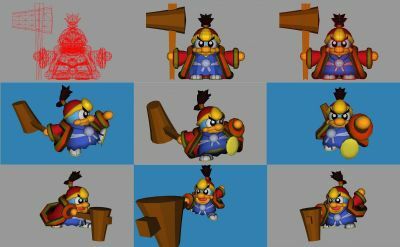 @ Lei: I made one regular Dedede model a year ago, but I have lost all the data from then. @ Bimblesnaff: I will try to cut back ^^*, Thankyou for returning Funny comic! @ Gallery Staff: Thankyou for returning, also!